We got the form letter from Caremark. They have a bad case of Uglycemia. The letter says they don’t care what the FDA label says about storage and temperature, they are shipping insulin without cool packs. Well that is a loose translation. A translation in the spirit of uglycemia is more like: "FU. We're saving a few cents." How hot do you think a delivery truck gets in direct sun on a few 78 degree days? So here is what has got me ticked off, well other than We-Don’t-Care-Mark’s actual existence, Lilly the wonderful makers of Humalog lobby their opposition to “middlemen whose interest are making money – not patients” ie no cheaper Canadian imports. They Lilly are the ones on file with the storage requirements at the FDA. Anyone think they will stop selling to CVS/Caremark? Thank you for helping me to keep my kids healthy. I am the parent of two Type 1 insulin dependent children. 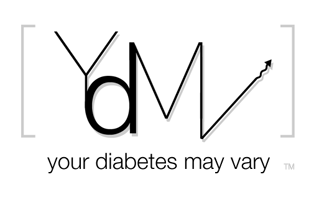 Your insulin keeps them alive. It is an understatement to say we use a lot of Eli Lilly products in our household. We buy Humalog a dozen and a half bottles at a time. It is in the dozen and a half at a time where my concern lies. I would like your instructions on what to do if the Humalog we are receiving does not meet Lilly’s safety standards. I know what to do when it gets home; it is in the getting here that I have concern about maintaining your standards. Like many patients in the US we receive our Humalog through Caremark, a domestic US mail order pharmacy. Our insurance requires us to use them and we are required to get 90 day supply at a given time. As you can image it is a big shipment of insulin. Over the years I have heard major drug companies, including Eli Lilly, stress the importance of the US drug supply chain as a safety issue. You have clearly told consumers, like our family, that you the manufacturers can not assure the proper handling of product from non US sources. Your lobbyists have testified to congress that the US drug supply system must be protected from imports as a safety issue. Specifically Eli Lilly has very clearly stated that they are opposed to middlemen “…whose interests are making money – not helping patients.” Again thank you for your concern for our safety. Clearly you care about safety and by inference you can use market forces in the US to assure safety. I’ll take your word for that. I must however ask you to stand behind your word. Specifically that you stand behind the safety of insulin shipped by firms like Caremark. 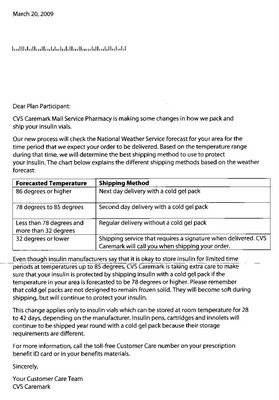 With your public concern for the safety of the supply chain I would like to know if it is safe to presume that you are aware that Caremark insist that insulin does not need to be shipped in cooled packages. They are telling families of type 1 children that insulin does not need to be refrigerated in shipping, only for long term storage. See the attached form letter from CVS Caremark. “How should I store Humalog? • Store all unopened (unused) Humalog in the original carton in a refrigerator at 36°F to 46°F (2°C to 8°C). Do not freeze. • Do not use Humalog that has been frozen. • Do not use after the expiration date printed on the carton and label. Storage — Unopened Humalog should be stored in a refrigerator [2° to 8°C (36° to 46°F)], but not in the freezer. Do not use Humalog if it has been frozen. Unrefrigerated [below 30°C (86°F)] vials, cartridges, and Pens must be used within 28 days or be discarded, even if they still contain Humalog. Protect from direct heat and light. I have always understood this storage to include shipping. Shipping can take a few days and trucks get hot. Further our experience is that Caremark’s delivery firm leaves the insulin on the front step in the sun in 90 degree weather. Lilly takes a clear stand on free markets. (http://www.lilly.com/about/public_affairs/positions/) You are for them. So am I. The way our free market works is you freely sell to Caremark as a trusted US supplier of Humalog to US patients, like my kids. I trust that you support the supply chain safety system and practices you have specifically lobby for. Our Humalog is safe. To be clear: This means you support the practice of shipping insulin without cooled containers by your US partner in the delivery chain because you continue to sell them product. You stand behind your product and remain responsible for its safety through the free market. You specifically use only middlemen whose interests include patient safety as well as profit. In the absence of clear written notice to the contrary, I can trust that Lilly stands fully behind the safety of insulin shipped without any temperature controls. In this case you agree specifically that a few days shipping and storage are not the same thing. If that is not the case, I trust you will take the free market steps necessary to assure the safety of the supply system, since you have strongly advocated for said system. Further if needed you will provide notice users with clear guidelines about shipping safety. I know that you have gone to great length and expense to communicate what you are for to our elected officials. I am sure you will be happy to be as clear with them on this issue. I will forward a copy of this letter to my elected officials so they can be prepared to hear how you are using market forces to insure that the products you provide in the market meet the labeling you have cleared with the FDA. 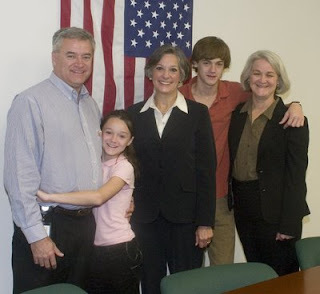 I will encourage my fellow type 1 parents to reach out to their elected officials as well. Barring a clear reply to the contrary, I and these other parents of Type 1 insulin dependent children can rely on Lilly to use free markets to protect the safety of our insulin. It is after all a responsibility that you have specifically asked for. Thanks again for helping keep the kids alive. Thank you for your service to our nation. We had the pleasure of meeting in your Jenkintown Office with a group supporting the Juvenile Diabetes Research Foundation a year or two ago. I was impressed by your to attention and understanding of type 1 diabetes as well as your commitment to fiscal responsibility with pay as you go. As the nation deals with economic stress and starts a process of examining our health care system I hope you can find a few minutes to ask the pharmaceutical industry to stand up for what they have been asking of you and your fellow representatives for years. Specifically to keep our domestic drug supply safe from those who would take risk to maximize profits. Lilly has filed specific temperature requirements for storage of their Humalog band of insulin with the FDA. Lilly’s distribution partner CVS Caremark has announced that they will not follow those guidelines when shipping insulin. I believe that we as consumers and you as our representative have the right to expect that Lilly and Caremark will follow the requirements agreed to with the FDA and the market conditions they have lobbied for. Sadly my experience with large companies is that they try to ignore or double talk their way out when dealing with consumers. This was certainly Caremark’s approach last summer when they shipped and subsequently took back $4,000 of insulin that was not kept cool in 90 degree weather. I hope that you have the time to have a letter sent to Lilly and Caremark and ask them to standby the drug labeling and the market freedoms they have lobbied for. I suspect that they maybe more responsible to a member of Congress than a consumer. Sad. I am fortunate that my healthcare provider fired CVS Caremark as their pharmacy benefits manager effective January 1, 2009 ... they brought the operation in-house (Wellpoint NextRx), although I learned that may be a short-lived move, as Wellpoint hired a Wall Street investment bank on March 6, 2009 to find a buyer, with Express Scripts being reported as the most likely buyer. Oh well, you can try a small claims lawsuit; if the company fails to show up to the courthouse, the case is automatically ruled in your favor. I hope you prevail - I've had the same issue repeatedly with Medco. I try to insist on first delivery of the morning. You wonder how hot UPS trucks get in 78 degrees. I wonder on days when it's in the high 90s. Once they told me we could get the insulin from the local pharmacy but only during the summer. I asked "Define summer in south Florida". Anyway, we've returned lots of insulin over the years - I mark every box and bottle as damaged. I just posted last week about butting heads with Caremark, albeit over a different issue. I've only been using them for a few months, and I'm already disgusted with them. I get most of my meds at the pharmacy, and was just experimenting with the mail order thing in an effort to save money. I think even if I got all my meds through them, I'd still get my insulin at the pharmacy though. I've heard too many horror stories about improper shipping of insulin. Regardless, I'm appalled that Caremark has taken this stance regarding insulin shipment. Well done! Thank you for taking the time to speak up and make a difference. Love that you are doing something about this! Good Luck! My employer uses CVS caremark, and I had no idea they were so crappy. I have always refused to do shipping on my insulin for that very reason. I just hit my local pharmacy. I get at least 2 letters from them each month asking me to switch. Not likely! I'm a Type 2 on insulin going through this same fight with CVS/Caremark over Lantus. I can't believe they think that the insulin in PENS is somehow magically different from that in VIALS and requires refrigeration when vial insulin "doesn't". I'm new to CVS/Caremark, so I never saw this letter before. I'm so angry with them right now, I can't eve begin to express it. I was given some BS on the phone today about a study from the VA that "proved" the hot insulin was "safe" to use. I said that was contrary to what the manufacturers recommend. I was told flat-out by both the pharmacist and the Senior Customer Care Rep that the company wasn't going to do anything differently. I had to use Express Scripts last year and had no problems with their shipping -- although who knows if they won't follow CVS/Caremark's lead? It's all about profit margins and that's it.